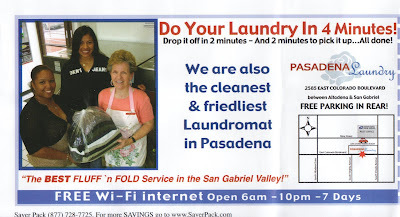 One of my friends looked at this ad the other night and exclaimed, "This place can do your laundry in two minutes? How can they do that?" Then looking at it closer said, "Never mind." She shouldn't feel bad. It reminded me of the time I was in the car with my sister, Cheryl. There was an ad on the radio promoting midget car racing. I asked Cheryl where she thought they got all the midgets to drive the cars. "It's midget cars, not midgets driving the cars, you idiot." She still won't let me forget that one. What, you don't like the friedliest people???? the ad said "do" what does that mean? like one of the ladies in the background ? how about "fluff are we talking about fabric material or "parts" of the anatomy ? thanks.